Actor Geoffrey Rush has given emotional testimony in court as he sues an Australian newspaper over stories that he says depicted him as a pervert. 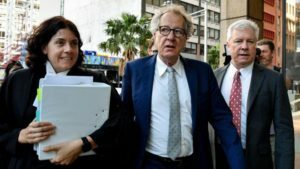 The Oscar winner is suing the Daily Telegraph’s publishers Nationwide News, which ran stories saying he had been accused of “inappropriate behaviour”. During a defamation hearing in Sydney, he denied inappropriately touching an actress with whom he appeared on stage. The company is standing by the stories, which were published in late 2017. The paper’s original story carried the headline “King Leer” and reported that Rush had been the subject of a complaint about his behaviour during a production of King Lear in 2015 and 2016. The court has heard that the allegations relate to his behaviour towards actress Eryn Jean Norvill, who played Cordelia. Rush told Sydney’s Federal Court that a text message he sent Ms Norvill, in which he said he was thinking about her “more than is socially appropriate”, was “a throwaway line” and a joke “in the style of Groucho Marx”. He denied suggestions by Nationwide News barrister Tom Blackburn SC that he was trying to tell her he was attracted to her. The 67-year-old also denied a defence allegation that he intentionally “traced” his hand across the side of her breast in a preview performance during the scene in which he carried Cordelia’s dead body. And he rejected claims that he touched her lower back under her shirt, made groping gestures with his hands to simulate touching her breasts, and made lewd comments. He dabbed away tears as he told the court he prepared for the scene in which he carried Norvill across the stage by imagining his own daughter had died. “I was imagining that it was my own real-life daughter and that she’d been hit by a bus on the street near where we live… and I knew she was gone,” the actor said. Rush said he did not recall being told by director Neil Armfield that the scene should be performed in a more “paternal” way and it was becoming “creepy and unclear”. He said he and Norvill had enjoyed a “very sparky, congenial rapport”. Rush is suing Nationwide News – owned by News Corp Australia – and journalist Jonathon Moran. He is seeking aggravated damages, arguing the articles significantly damaged his reputation. The trial is expected to last for three weeks.